When James Donovan went to Berlin, to negotiate an exchange of Rudolf Abel for Francis Gary Powers, he entered a city divided by a wall. This image depicts construction of the Berlin Wall during August of 1961, about six months before Donovan arrived in Berlin. Image by Corey Hatch, University of Utah. Fair use for educational purposes. With the federal government’s approval, Jim Donovan sent a letter to “Frau Abel,” agreeing to meet with her in East Berlin. Already a walled-in city, East Berlin - to some people - seemed like an ominous place. Once inside the wall, was a person free to leave? Donovan agreed to meet with Frau Abel, at the Soviet Embassy, at noon on February 3, 1962. There were two other Americans being held by the Soviet Bloc - one in East Germany (a Yale student, from Michigan, named Frederic L. Pryor) and another in Kiev (a University of Pennsylvania student, Marvin Makinen) - who could be part of an exchange. Donovan’s priority, however, was to negotiate a deal exchanging Abel for Powers. He would work with an East-German lawyer named Wolfgang Vogel. 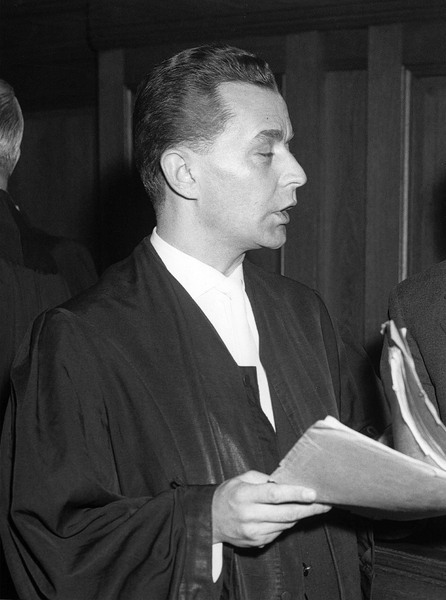 Without knowing for sure whether he could trust “Frau Abel” and the East-Berlin lawyer - Wolfgang Vogel - Donovan went to Berlin. Exemplifying the current state of affairs between America and the Soviets, the weather was cold and snowy. I have come to Berlin for only one reason. An East German lawyer named Wolfgang Vogel sent me a message that Mrs. Abel believed that if I could arrange the release of her husband, this would free Powers, the American student, Pryor, held in East Germany and the American student Makinen now in prison in Kiev. As negotiations gave way to tentative plans, Donovan raised the possibility of exchanging the prisoners on a bridge which connected the American sector of Berlin to Potsdam. The site of the Potsdam Conference, at the end of WWII, was now part of East Germany. Bos, Carole "JAMES DONOVAN GOES to BERLIN" AwesomeStories.com. Sep 22, 2015. Apr 23, 2019.